After 15 years of big open gardens we decided enough was enough and we would have to find a simpler way as the workload involved in a BIG Open Garden was starting to take its strain on us. We were thinking of not to opening our garden at all, but due to public pressure we have decided to still do it, but do it much easier and with much less work and stress. 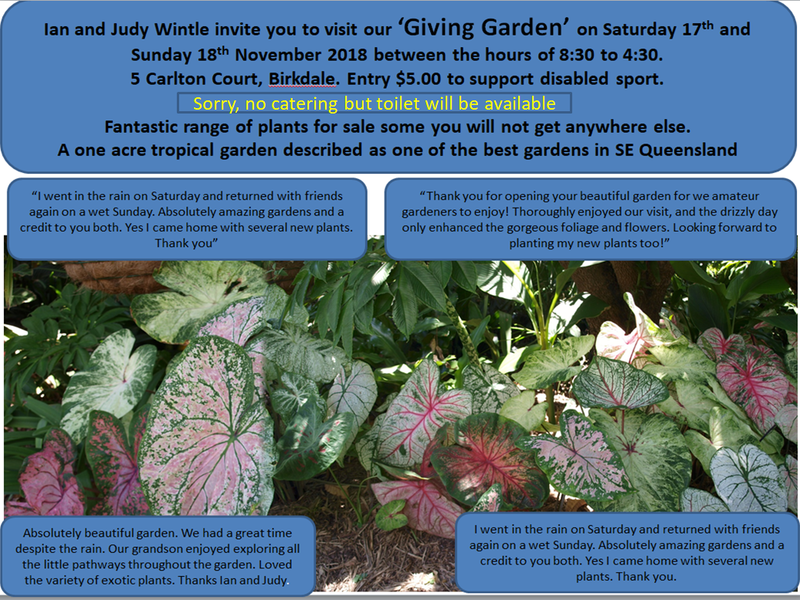 So the idea of having an annual plant sale came into mind with a small entry fee of $5 into the garden which will go to disabled sport. After raising round about $60,000 for charity through our previous openings we thought this year would be a good idea to help our son who is a paraplegic compete in his last ‘Disabled World Water Ski Championships’ which are going to be held in Norway 2019. The garden is looking great and November is probably the best month for colour and bizarre and interesting plants displayed. If you have been previously, please come again as we have been busy in the garden. So there you go, you can visit our beautiful garden again. Don’t forget Judy will have some fantastic plants for sale, some of which you will not see elsewhere. We are only home gardeners, NOT a business so we cannot accept EFPOS or credit cards and please bring your own bags. Kaspar will be here selling fruit trees and Erica will have her cards and wonderful wildlife photos for sale. There will be a toilet available but no catering, there will be seating so bring your own cuppa if you like. Hopefully we will see you on Saturday 17th and Sunday 18th November 2018 between 8:30 and 4:30.